Some writers and dachshund experts have theorized that the early roots of the dachshund go back to ancient Egypt, where engravings were made featuring short-legged hunting dogs. Recent discoveries by the American University in Cairo of mummified dachshund-like dogs from ancient Egyptian burial urns may lend credibility to this theory. 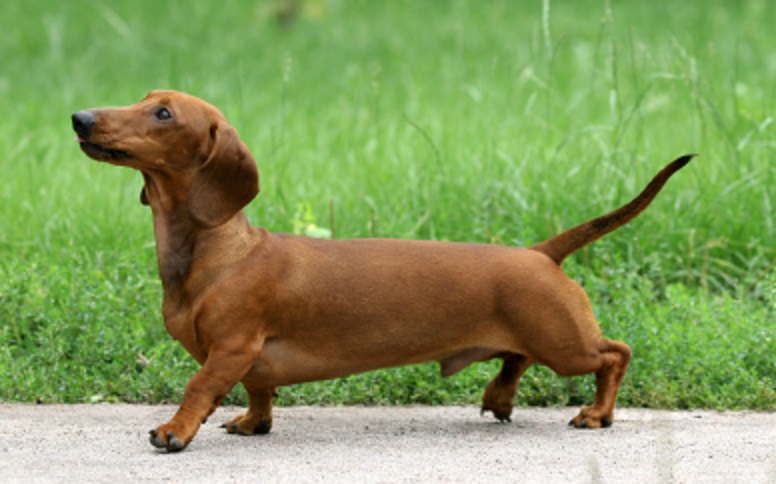 In its modern incarnation, the dachshund is a creation of German breeders and includes elements of German, French, and English hounds and terriers. Dachshunds have been kept by royal courts all over Europe, including that of Queen Victoria, who was particularly enamored of the breed. They were originally bred for hunting badgers by trailing scent. The first verifiable references to the dachshund, originally named the "Dachs Kriecher" ("badger crawler") or "Dachs Krieger" ("badger warrior"), came from books written in the early 18th century. Prior to that, there exist references to "badger dogs" and "hole dogs", but these likely refer to purposes rather than to specific breeds. The original German dachshunds were larger than the modern full-size variety, weighing between 30 and 40 lb (14 and 18 kg), and originally came in straight-legged and crook-legged varieties (the modern dachshund is descended from the latter). Though the breed is famous for its use in exterminating badgers and badger-baiting, dachshunds were also commonly used for rabbit and fox hunting, for locating wounded deer, and in packs were known to hunt game as large as wild boar and as fierce as the wolverine. There are huge differences of opinion as to when dachshunds were specifically bred for their purpose of badger hunting, as the American Kennel Club states the dachshund was bred in the 15th century, while the Dachshund Club of America states that foresters bred the dogs in the 18th or 19th century. Double-dapple dachshunds, which are prone to eye disease, blindness, or hearing problems, are generally believed to have been introduced to the United States between 1879 and 1885. The flap-down ears and famous curved tail of the dachshund have deliberately been bred into the dog. In the case of the ears, this is to keep grass seeds, dirt, and other matter from entering the ear canal. The curved tail is dual-purposed: to be seen more easily in long grass and, in the case of burrowing dachshunds, to help haul the dog out if it becomes stuck in a burrow. The smooth-haired dachshund, the oldest style, may be a cross between the German Shorthaired Pointer, a Pinscher, and a Bracke (a type of bloodhound), or to have been produced by crossing a short Bruno Jura Hound with a pinscher. Others believe it was a cross from a miniature French pointer and a pinscher; others claim that it was developed from the St. Hubert Hound, also a bloodhound, in the 18th century, and still others believe that they were descended from Basset Hounds, based upon their scent abilities and general appearance. The exact origins of the dachshund are therefore unknown. According to William Loeffler, from The American Book of the Dog (1891), in the chapter on dachshunds: "The origin of the Dachshund is in doubt, our best authorities disagreeing as to the beginning of the breed". What can be agreed on, however, is that the short-haired dachshund gave rise to both the long-haired and the wire-haired varieties. There are two theories about how the standard longhair dachshund came about. One theory is that smooth Dachshunds would occasionally produce puppies which had slightly longer hair than their parents. By selectively breeding these animals, breeders eventually produced a dog which consistently produced longhair offspring, and the longhair dachshund was born. Another theory is that the standard longhair dachshund was developed by breeding smooth dachshunds with various land and water spaniels. The long-haired dachshund may be a cross among any of the small dog breeds in the spaniel group, including the German Stoberhund, and the smooth-haired dachshund. The wire-haired dachshund, the last to develop, was bred in the late 19th century. There is a possibility the wire-haired dachshund was a cross between the smooth dachshund and various hard-coated terriers and wire-haired pinschers, such as the Schnauzer, the Dandie Dinmont Terrier, the German Wirehaired Pointer, or perhaps the Scottish Terrier.